As in previous years, my day started out at about 4:30am with coffee and breakfast to then head out to Worcester to catch the Central Mass Striders's bus to the start line. We arrive at Hopkinton at 7:30 to then hang around til our start times. Elites start at 10am, but for us mere mortals, we get to start at 11:15. Thats a lot of waiting around. At about 10:30 or so, I start heading towards the start line corrals which is about a mile or so away from athletes village. I meet up with my good friend Chuck, which I had planned on running with, and head on to the start. Chuck and I run about the same pace, so it was cool to have someone to run with. We had talked about running together for weeks so I'm glad it worked out. This was Chuck's first ever Boston, so I can tell he was both excited and nervous. He kept telling me that if at any point I wanted to take off on him during the run, to just go. But I kept assuring him that I was with him for the long run. I've known Chuck for almost 23yrs. He is a great guy, a role model and a great friend. I was honored to be able to run with him. The race starts on time and off we go. For the first 5 miles or so, you are just fighting the crowd and trying to find a good rhythm. Its so hard to do, with thousands of people all around you. We were probably doing about a 9:30min pace at the start. Even with the rain, there were tons spectators showing their support. It was unreal. At mile 6, a handful our Tri-State Running group were out there showing us some love. It was awesome to see them out there. We ran good throughout the race. I know at times I wasn't feeling it and thought to myself that if I were running alone, I probably would have stopped to take a breather or two. At mile 11, I had side stitches that were killing me. But the fact that I was running with Chuck kept me going. He showed no signs of being tired or hurt. If he did hurt, he did a good job of not showing it. I at times was dying inside... LOL..
Once we approached the Newton hills, we kept mentally preparing ourselves. "We got this man"... "Nice and steady",.. "Just a few bumps and then it all down hill"..., we kept saying to each other. Anything to keep us going at this point. Half way up Heart Break Hill at about mile 19 or so, I catch a glace of a tired and cold, but beautiful lady standing in the rain. It was my mom. Standing next to her, my proud father. I told Chuck to keep going and that I would catch up. I had to stop to greet them. I gave them both a hug and a kiss and wanted to chat for a sec, but my dad snapped a picture and said "Go, go, go!!" ... so off I went. As I slowly go over the top of Heartbreak (mile 21) started walking again. "Ugh, here we go again" I thought to myself. This the exact same spot where the last two Boston I crapped out. I walked for a bit, but it was cold and the wind really started to pick up. 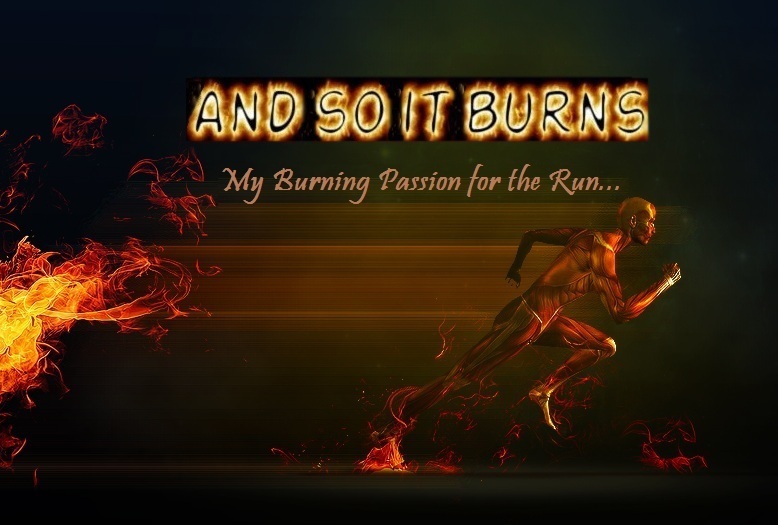 So I started a slow jog again just to stay warm. By mile 22, I started feeling a bit better. My legs weren't as heavy as they we were at mile 21. As I approached mile 23, I glanced down at my Garmin and realized that I was 27 mins from the 4 hour mark. I'm not that good at math to begin with, and during a marathon is probably not a good time to start calculating a pace\time equations. But after having visions of my math teacher reciting "My Dear Aunt Sally" theory, I realized that if I stayed at this pace and not walk, I can probably make it under four hours. With that in mind, I got a second wind like no other. Where my pace had been closer to a 10min mile since I stopped to see my parents, I had picked it up to an 8min pace. At mile 24 I caught up with my friend Chuck and I patted him on the back and as I gasped for air I let out "C'Mon Chuck, we can still make it!" .... all I heard was "Go. Go get your sub four"... That was all I needed to hear to go on. Those last two miles were a blur. All I remember were the chants of "Go Beardman!!" and "Run Forest Run!"..... I just put my head down and focused on the next step. The crowds got louder and louder as I approached Hereford St.. As I made that right, I remember getting those thoughts of "I can't believe that I'm actually here" like I did those two previous years. This is where it all felt real. Left onto Boylston and I heard someone scream out my name. 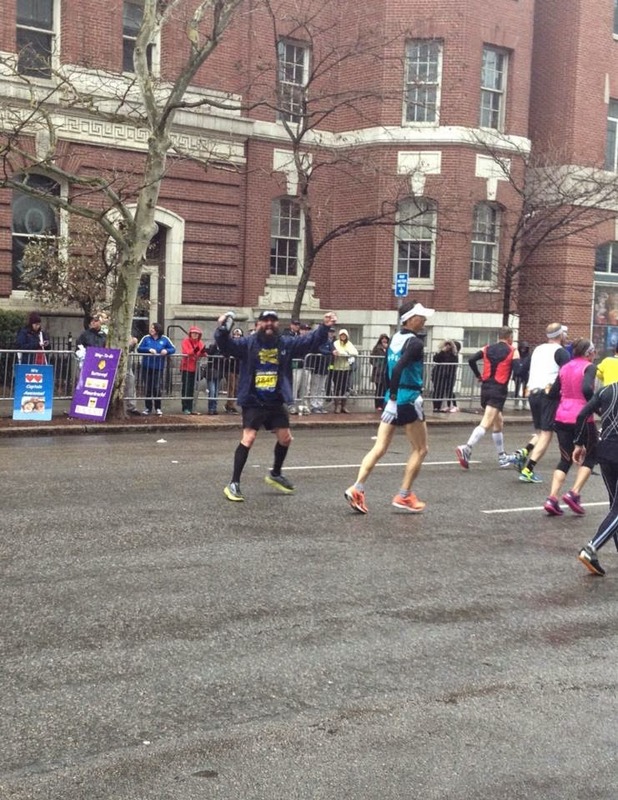 My TSR group, the same group that had cheered me on in Framingham at mile 6, where there, screaming with excitement! I can't tell you how good that felt!!! 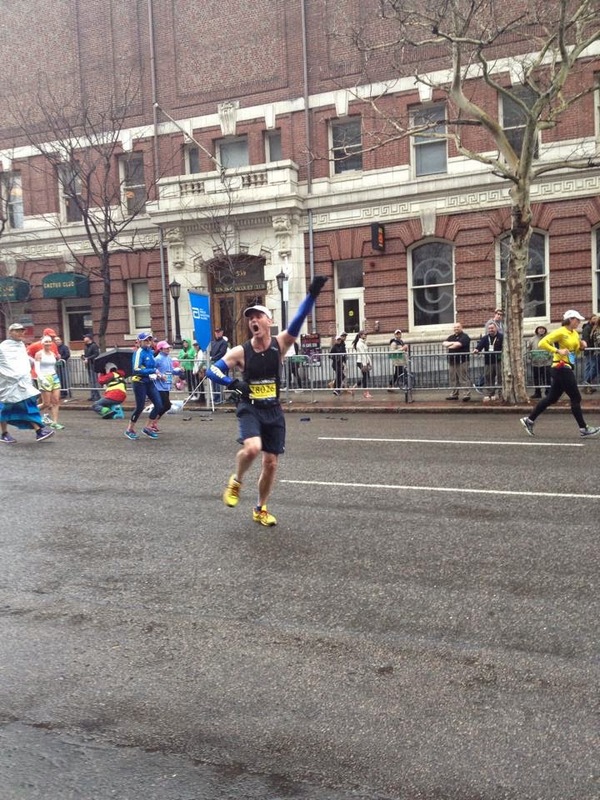 Someone snagged a grizzly picture of me on Boylston! My Garmin had gone into power save mode so I had no clue what my time was, but I knew I had to be close. As I approached the finish line the time for our wave read 4:05 so I was unsure if I got the sub 4, but as I crossed and finally stopped my Garmin it read 3:59:29 !!! Did I get it?? I saw my wife and daughters shortly after as they were calling for me and my wife informed me that she got the text result and I had indeed got my sub 4!!! 3:59:27 !!!! The rain, the wind the cold did not matter at this point!! I finally broke 4 hours at Boston!!! But after a few pictures with them, the cold, rain and wind did matter. I was freezing!!! 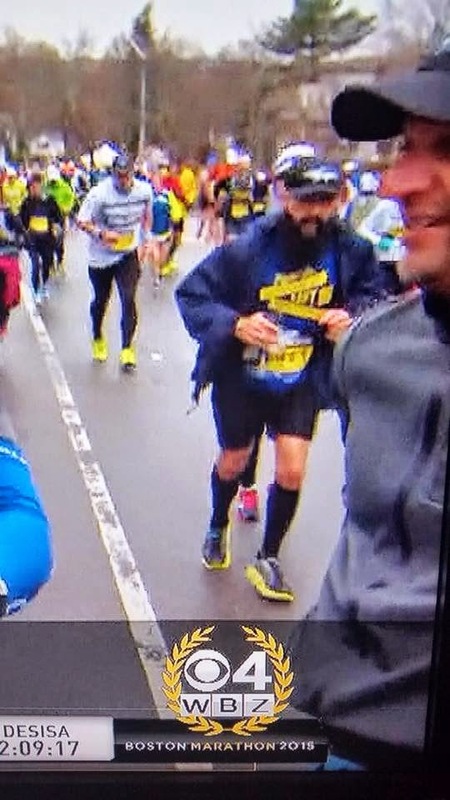 My friend Chuck came right behind me with an impressive 4:01 for his first ever Boston !! Chuck really knows how to get the crowd roaring!!! I am so honored to have run this race with my friend Chuck. He was a big part of my life when I was 17-18yrs old when I went into the Navy. I respected him and always looked up to him. It was recently through our running club that we reconnected again. When he ran his first marathon back in the fall of 2014, he sent me a massage saying how much I had inspired him to run his first marathon. It felt like my life had come full circle. Chuck is a great athlete, a great runner and an around great guy. Proud to call him a friend. Congrats Chuck on fulfilling a lifelong dream of running Boston!!! Another successful marathon in the books. This for me is marathon #9. Already feeling the peer pressure of doing a fall marathon. I have gotten a few FB messages about running the MCM in DC. Haven't decided on anything yet. But the likelihood of marathon #10 happening in the fall is on the positive side. I just dont want to decide right away. But the fact remains that I would like to do Boston again next year. The excitement about this race pulls me in every time. Just hoping the stars align for next year for this to happen. 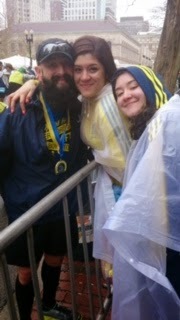 As always, I want to thank my lovely wife and daughters for putting up with the crappy weather and hanging out at the finish line for hours to see me cross. They mean the world to me and I thank god everyday for making me the luckiest man alive. oh well... Thanks for reading. til my next adventure!! Awesome job Jose!! And what a great experience to run with your friend Chuck. Your training throughout this crazy winter was inspiring - so glad you got your sub-4! Congratulations. That's a fantastic result! I don't know where you pulled those 8 min miles from that late in the race - I'm totally in awe.